What to Wear? | Idealist Girl! These people died making clothes that people in the first world would likely buy for $10 and wear for one season. Enough is enough. I grew up in L.A., a fact which I seldom cop to here in the Pacific Northwest. Mostly because most people are somewhat shocked to find out that I am an Angelena. I have managed to erase most telltale signs with my permanent ponytail, complete lack of make-up, refusal to carry an umbrella and the owning of Merrills in more than one color (because, hey they go with everything, right? Even if they do look – as an L.A. friend once told me – like I am wearing baked potatoes on my feet). Admittedly, I have never been one for high fashion. I can spend hours sewing costumes for Ren Faires and pirate festivals, but most days I am quite content to pull on jeans and a long sleeve t-shirt and call it good enough. Ever since I started caring about the environment and human rights, however, I have had an even more difficult time figuring out what to purchase. I gave up shopping at Gap/Old Navy in the 1990s when I lived in Berkeley. They were logging old growth redwood forests so I stopped buying their products. I love me some Julia Butterfly Hill. Not wanting to purchase clothes from places where women were chained to sewing machines or where factories poured rayon byproducts into waterways, I started to look for the “made in the USA” label. Clothes made here might cost more, but at least I could rest easy knowing that we have environmental regulations and unions. I remembered lovely ad campaigns from my childhood in which folks walked into regular looking department stores, checked the label, and bought actual made-in-the-USA clothing. With the exception of American Apparel, I don’t think that tag even exists anymore. Certainly not at Target, Macy’s, REI or any other store I’ve frequented lately. Internet searches uncover a few options – but I hate shopping for clothes by mail. It’s hard enough trying to find something that fits well in person. So here’s the cycle I got into: Hit the thrift stores quarterly to buy some seasonal staples. In between, scavenge from friends and family. Attend clothes swaps. Wear everything until it has been patched or is misshapen from over-laundering. Once every two-three years, hold my breath, plug my ears and dash into the nearest department store for jeans and other staples. Hate myself for making that choice for one full season. Lather, rinse, repeat. Relying on thrift, consignment and vintage stores to fill in my wardrobe gaps, begging stuff off my sister and patching my jeans worked pretty well until I birthed baby #1 and my shape changed. And then baby #2 arrived, giving me yet another new shape. Then I turned 40 and it’s all changing again (and not for the better!). My wardrobe needs revamping – desperately. 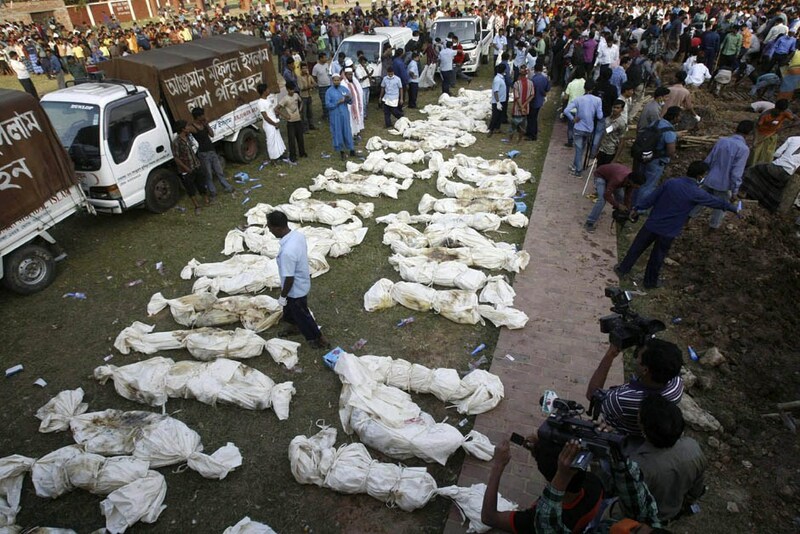 But since the tragedy in Bangladesh, I have been paralyzed. I simply can’t clothe myself in clothing made by people who are suffering, underpaid, unsafe, and so forth. I would rather go naked. Except it does get chilly up here. So, apart from mail ordering from the few responsible companies like Fair Indigo, Hanna Andersson, and Patagonia – what’s a person to do? Sew everything herself? Possibly – though I’d still have to be careful of the source of my fabric. Join a commune? Possibly – though I don’t think Dave would put up with patchouli-burning housemates for very long. The truth is I don’t have a good answer. And I need new pants, which I have had no luck finding at Goodwill nor at clothes swaps. So – I am looking for suggestions, sympathy and support. Who has found a solution that works for them? And lest you think I’m crazy (and maybe you still will), here are some quick looks into slavery and apparel and textiles and the environment. I hear you, and sympathize. My grandmother used to work in the garment industry, in a sweat shop. Her parents lied about her age so she could help support the family. That was a century ago in the USA. As an adult, she made all her clothes because she said the ready made stuff was ‘chintzy’, not worth the price. Now it’s a whole lot cheaper, but we pay a different price. It’s a dilemma, the factories are providing much needed jobs, but they’re also exploiting the workers and endangering them and wrecking the environment, because they can get away with it. It’s an economic reality that most folks will go for the lowest price, especially when they’ve got a limited income and a family to clothe. But until the industry itself changes, (yeah, right) cheap, disposable clothes, made in poor working conditions are going to remain the norm. A handful of us refusniks ain’t going to make a whole lot of difference.